Torino produced one of their finest performances in recent history to progress to the last 16 of the Europa League after a 3-2 victory (5-4 on aggregate) over Athletic Bilbao on Thursday evening. As expected, Fabio Quagliarella started alongside two goal hero from the first leg Maxi Lopez, whilst Giuseppe Vives replaced the suspended Marco Benassi. The Granata made the perfect start when after only fifteen minutes, Vives was tripped in the area by Bilbao captain Carlos Gurpegi in the penalty area. Fabio Quagliarella stepped up and converted the spot kick, although home keeper Iago Herrerín did get a hand to it. Just two minutes before half time, Bilbao equalised when Beñat's exquisite pass found wing back Andoni Iraola who took a touch before lifting over Daniele Padelli. However, Toro still took a lead into the half time break, as in first half injury time, Matteo Darmian's cross found Maxi Lopez who headed home. Toro wasted a couple of chances on the counter attack to put the tie beyond any doubt, and were punished on the hour mark when Iker Munian's through ball found Oscar de Marcos who slid the ball into the far corner. But for the second time in the match, Torino responded almost immediately as Omar El Kaddouri's cross found Matteo Darmian in space, and the Italian international volleyed the ball past Herrerín. Substitute Josef Martinez missed a great chance to give Toro a more comfortable margin of the victory, but the Venezuelan striker somehow missed the target after rounding the keeper. Toro managed to hold on for a famous victory, and the squad were given a heroes welcome on their return to Turin Airport in the early hours of Friday morning. In Friday's draw for the last 16 of the Europa League, Torino were drawn against Zenit St Petersburg, and will face the first leg in Russia on March 12th. Torino will head to Bilbao on Thursday evening knowing that only a victory or a high scoring draw will continue their European adventure. After trips to Sweden, Croatia, Belgium, Finland and Denmark and now Spain, Toro supporters are dreaming of this unlikely European run to be extended into March. The Granata will be without the suspended Marco Benassi, whilst Fabio Quagliarella could start after surprisingly beginning the first leg on the bench a week ago. Athletic have struggled at home in recent weeks, losing four of their last six matches, and Toro will hope to exploit this. Torino maintained their unbeaten league record as they fought back in the latter stages to earn a 1-1 drawn with Fiorentina on Sunday night. Pontus Jansson started in place of Kamil Glik, whilst as expected, Maxi Lopez started along with Fabio Quagliarella up front. The Granata made a poor start, and after only ten minutes the home side were awarded a penalty when Marco Benassi fouled Milan Badelj in the area. However, Khouma Babacar was denied from the spot as Daniele Padelli dived the right way to deny the Senegalese striker. Toro's best chance of the first half came when Quagliarella's neat back heel found Maxi Lopez in space but the Argentinean was denied by Fiorentina keeper Ciprian Tatarusanu. The Viola were dominating possession, but Toro always looked a threat on the counter attack and substitute Josef Martinez almost gave Torino a shock lead when he lifted the ball over the onrushing Tatarusanu, but his shot was cleared off the line. Khouma Babacar almost made amends for his missed penalty, but his volley from outside the area narrowly flew over the bar. However, with just five minutes remaining substitute Mohamed Salah continued his impressive start at his new club as he gave Fiorentina a lead from just inside the area. However just two minutes later the home side were inexplicably caught on the counter attack, and Cristian Molinaro's cross eventually made its way to Giuseppe Vives who kept calm to volley home an important equaliser. This was a positive performance from Toro who showed the type of spirit they will need in Bilbao on Thursday night in order to prolong their European adventure. 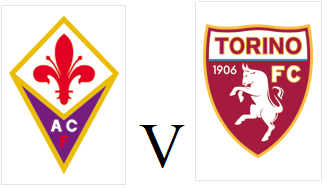 Torino will look to extend their unbeaten run when they travel to Florence to face in-form Fiorentina on Thursday evening. The Granata are without the suspended Cesare Bovo and Omar El Kaddouri, so Nikola Maksimovic and Alexander Farnerud should both come into the side - whilst Maxi Lopez could continue upfront after his brace against Athletic Bilbao in midweek. The home side are also on a long unbeaten run, and have only lost one match in 2015, a surprising 1-0 defeat to Parma back in January. This fixture was a dramatic one last season, as on the final day of the season, Alessio Cerci missed a last minute penalty that would have guaranteed European football for Toro. As it turned out, Torino qualified for Europe anyway due to Parma's financial difficulties - which are unfortunately still continuing. Torino will need to produce a special performance in Bilbao in order to qualify for the last 16 of the Europa League, after being held to a 2-2 draw by the Athletic on Thursday night. Giampiero Ventura surprisingly left top scorer Fabio Quagliarella on the bench as Josef Martinez and Maxi Lopez started upfront. Despite a promising start by the hosts, Toro were behind in only nine minutes as Borja Viguera's left wing cross was turned in by young striker Iñaki Williams, who was making his European debut for the Basque side. The Granata responded well though, and were level less than ten minutes later after great interplay by Omar El Kaddouri and Cristian Molinaro, and the latter provided the cross for Maxi Lopez to turn into the net. Josef Martinez missed an excellent chance to give Toro a lead, but he was unable to make sufficient contact on Matteo Darmian's cross. However, moments later, Torino did take the lead as another fine cross from Italy international Darmian was met by Lopez whose header flew into the far corner. Toro looked like they would travel to Spain with a first leg lead intact, but seventeen minutes from time Carlos Gurpegi headed home Beñat's free kick to equalise. Things almost got worse for Toro as Bilbao hit the bar late on, but the game ended level and the advantage lies with the La Liga side ahead of the second leg. 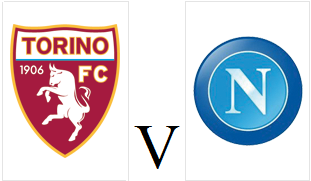 Torino will need either a victory, or a high scoring draw in order to qualify for the last 16, which is a difficult but not impossible task. Torino were unable to record a fifth consecutive victory as they were held to a 1-1 draw at home to relegation-threatened Cagliari on Sunday afternoon. The introduction of Matteo Darmian and Omar El Kaddouri were the only alterations from the starting eleven that beat Hellas Verona six days previously. Cagliari goalkeeper Željko Brkić made a smart save early on to deny Marco Benassi's deflected effort from distance. With ten minutes remaining until half time, it was the Sardinians who took the lead, somewhat against the run of play, as midfielder Godfred Donsah fired the ball past Daniele Padelli from the edge of the area. However, the Granata showed immense character and equalised almost immediately after the restart. Bruno Peres' initial effort was blocked, but the ball rebounded to Omar El Kaddouri who casually controlled the ball on his thigh before volleying into the net. Toro had the better of the second half, but Brkić was performing heroics in the Cagliari goal to keep them at bay, as the Serbian first denied Matteo Darmian, and then Fabio Quagliarella from close range. Captain Kamil Glik also had an opportunity to extend his excellent goal scoring record this season, but the Polish international headed wide of the target. Torino had to make do with a point, which meant their run of consecutive victories ended at four - but their run of games without defeat in the league was extended to ten. 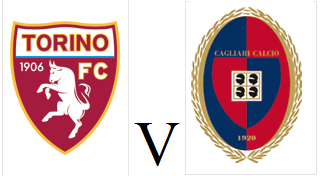 Torino can continue their outstanding recent form as the face Cagliari on Sunday afternoon looking for a fifth consecutive league victory. Alexander Farnerud, who has been a great form, will miss the game due to suffering from the fleu and he should be replaced by Omar El Kaddouri - who scored in last weekend's victory at Hellas Verona. The other goal scorers from that game, Josef Martinez and Fabio Quagliarella should both start although Maxi Lopez has recovered from illness and is included in the squad. Cagliari are currently in the bottom three and club legend Gianfranco Zola has been tasked with keeping the club in the division. However the Sardinians have lost their last two games, and have not won away from home since October. Torino continued their incredible recent form with a fourth consecutive victory after an impressive 3-1 victory over Hellas Verona on Saturday evening. Giampiero Ventura made just two changes from the team that convincingly beat Sampdoria last weekend, as Cristian Molinaro and Giuseppe Vives replaced Matteo Darmian and Alessandro Gazzi. Josef Martinez was causing the home side's ageing back line a number of problems in the early stages, and the Venezuelan striker earned his reward on the half hour mark. After some excellent interplay on the edge of the area between Fabio Quagliarella, Marco Benassi and Martinez himself, the ball fell to the latter and he calmly stroked the ball past former Toro keeper Francesco Benussi. Martinez was again involved in Toro's second goal, as just five minutes into the second half the young striker was upended in the area by Hellas defender Rafael Marques. And just as he had done so against Sampdoria, Fabio Quagliarella stepped up to convert the penalty - although once again, it was a little bit too close to being yet another missed Torino penalty. Marco Benassi had an opportunity to seal the points for Toro, but his shot was off target, whilst the Granata were somehow denied a penalty when Quagliarella was clearly tripped in the area Rafael Márquez. Torino ensured a nervy last ten minutes when Luca Toni's volley reduced the deficit, although Daniele Padelli may feel he could have done more to prevent the goal. However, Torino did seal the victory in injury time thanks to substitute Omar El Kaddouri, who ran the length on the field with an outstanding solo effort before curling a shot into the bottom corner. This was an extremely confident performance from a Torino team who almost look unrecognisable from the side who struggled for goals and creativity earlier on in the season. If Toro can maintain this form for a little while longer, than European qualification for a second consecutive season is beginning to look extremely attainable indeed. 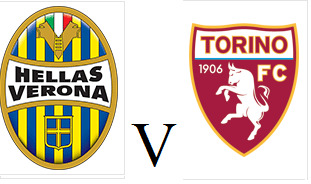 Torino will look to continue their impressive recent form when they visit Hellas Verona on Saturday evening. The Granata are unbeaten in their last eight games, winning the last three, the most recent of which being the impressive 5-1 victory over Sampdoria last weekend. Alessandro Gazzi is suspended, so could be replaced in the starting eleven by new signing Alvaro Gonzalez. Maxi Lopez also misses out with the flu, so Josef Martinez should continue to partner Fabio Quagliarella up front. Hellas are currently four points and four places below Toro in the league table, but have won their last two home games and also recorded a 1-0 victory over Torino back in September at the Stadio Olimpico. Torino won their third game in succession with a 5-1 victory over Sampdoria at the Stadio Olimpico on Sunday afternoon. Giampiero Ventura made just the two changes from the side who conquered Inter at the San Siro as Bruno Peres and Cesare Bovo came into the starting eleven. Toro took the lead after only fifteen minutes, when Alexander Farnerud's corner caused havoc and allowed former Samp striker Fabio Quagliarella to volley home from close range. Toro were awarded a penalty fifteen minutes later, when Matías Silvestre hauled down Kamil Glik in the area. The home side have had issues from the spot this season, but Fabio Quagliarella fired past Emiliano Viviano to double the Granata's lead. Twenty minutes into the second half, the result was put beyond any doubt when Marco Benassi's cross found Quagliarella completed his hat trick with a fine strike into the bottom corner. Substitute Amauri scored his first league goal for the club when he converted Bruno Peres' cross at the second attempt as Toro incredibly went 4-0 up. That lead lasted for only two minutes however, as Pedro Obiang scored arguably the goal of the game as he flicked in Lorenzo De Silvestri's low cross. However, there was still time for Toro to score again as Bruno Peres added another solo effort to his highlight reel as the wing back beat a number of defenders before curling a shot into the corner of the net. This was an impressive performance from Toro, arguably their best of the season, as they made it an eighth game without defeat. With Toro quietly rising up the table, an improvement on last season's 7th placed finish may not yet be out of the question.